Last year as I was unpacking our Christmas decorations I realized something. Most of my decorations were junk! They were mismatched, plastic and lacked any character. I used them anyways because they were better than nothing. This year I’m determined to find nicer decorations whether I’m buying them, finding them at local craft fairs or making them myself. In this day and age, possibilities are at our fingertips with the Internet. You can find pretty much anything imaginable including DIY Christmas decoration tutorials. I know because I’ve looked! I started a Christmas craft list of projects I like. Hopefully, I can make several from this list to accent our Christmas decor. Then I can ditch some of the more junkier decorations I already own. If you’re like me and want to try your hand with a few DIY projects too, you’re in luck today. I’m sharing my list of 25 DIY Christmas decorations. Take a look and save the ones you think would be a good fit for your decor. 2. DIY Christmas Card Holder | Home. Made. Interest. For more inspiration, check out my Christmas Pinterest board. Which projects catch your eye? I love DIY projects and I like the Christmas Card Holder and the DIY Christmas trees that are made with silver paint and decorations. I want to make the trees and see how they turn out. They have trees like these at Target, but they are expensive. Love some of these ideas, I should really make some to go with some of my holiday gifts. There are some AWESOME ideas here! Thank you for including my DIY Christmas topiary tree! I make them every year and everyone loves them! I love getting together and doing crafts! 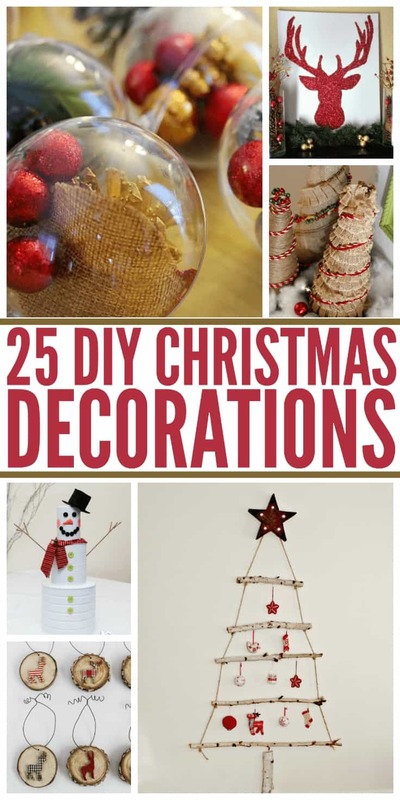 So many nice ideas here – I esp love the Twig and Wire Christmas Ornaments and want to try it! So many great idea! Really loving the DIY Burlap Christmas Trees. So pretty! The Christmas topiary tree would be an awesome unique gift as well. These are great. Going to book mark this and try a few with the kids. 😀 Thank you.